I am a fan of Donny Osmond especially during my childhood days and love the song Puppy Love! 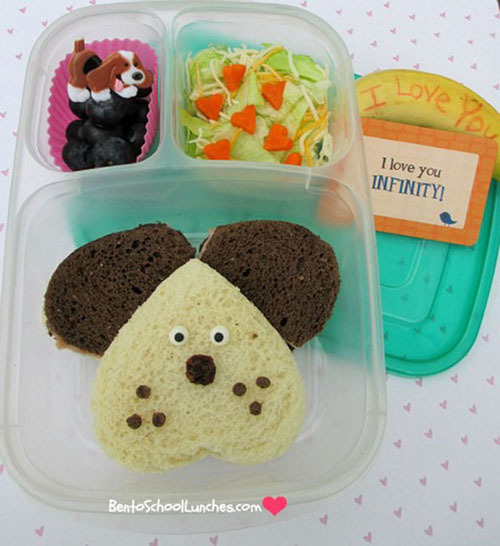 My hubby loves pumpernickel bread which presently we have on hand, so I thought it will be great to use some for this Valentine's puppy bento. I have made a couple of puppy bentos previously but it's nice to experiment with different kind of breads. Puppy face sandwich made with a heart shaped cookie cutter for face and ears, candy eyes, raisin nose and pumpernickel bread for ears and freckles. Salad with shredded cheese and heart shaped carrots. I included salad dressing and a fork but not in picture. I used food safe marker for lettering on the banana. Packed in our new Easylunchboxes brights. and I also included a lunchbox love note. I love this puppy lunch! so cute. Oh, how I loved Donny Osmond. I actually got to meet him when I was in my twenties! He was very sweet. Your puppy sandwich is adorable.